Unlike many beer and wine drinkers, I’m not usually a sucker for a label based purchase. Nor does the story behind the beer or wine make me want to drink it any more than another option. But I have to admit that this theory went out of the window somewhat with the Norton Lager. You see Norton is a beautiful old brand of British built motorcycles (you can read more about them here.) I too, am a beautiful old brand of British built machinery. Ok, maybe not beautiful, but I’m definitely getting old and I am British built. 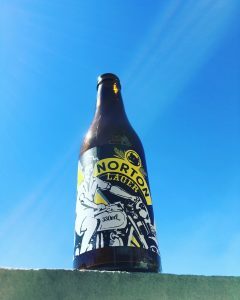 Anyway, Norton Lager features one of the famous bikes on the label all because of the brewer’s Dad. Paul Holgate, of Holgate Brewhouse in Victoria, named the beer after his Father, who used to roam the English roads on a Norton… what a lovely touch. What about the beer I hear you all shout! Well, this is a German inspired pilsner/lager. It’s beautifully refreshing, with a small amount of bitterness and a hint of lemon to the finish. I really like this. I also really like the label, but then again, you already know that!